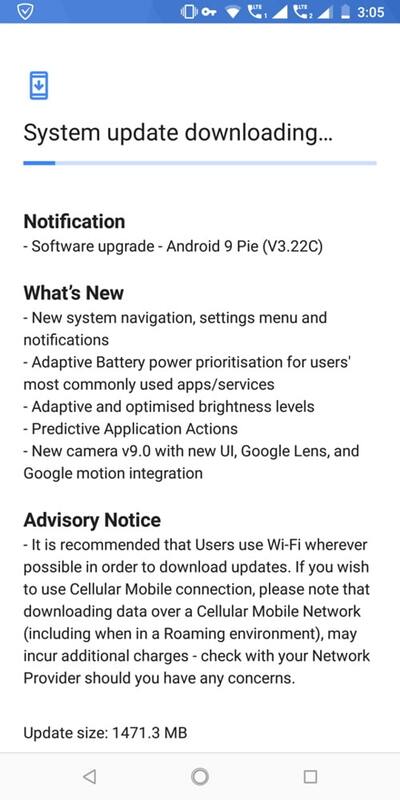 Nokia 7 Plus is now getting official stable Android 9 Pie OTA update with September 2018 Android Security Patch. The Android One device is finally out of Beta firmware (Developer Preview). Users are now receiving the official update across the globe. The update is currently live in the regions of Asia for the model number TA-1046. Moreover, users of Nokia 7 Plus have also captured the update and here we have the OTA zip available for download. The product manager of HMD Global (Nokia) tweeted that the official Android 9 Pie build is currently rolling out for the Nokia 7 Plus. It features all the Android P features including adaptive battery, adaptive brightness, slice, Digital Wellbeing, new navigation gesture support, and much more. Most importantly, it packs a new camera v9.0 with new UI, Google Lens, and Google Motion integration. The new OTA is also based on the new September 2018 Security Patch. It upgrade Nokia 7 Plus to a new firmware build number WW 3.22C September 2018 B2N-322C-0-00WW-B01. You can update Nokia 7 Plus manually regardless if your device is on the Stable Build or Developer Preview Build using the OTA update listed below. What’s new with latest Android Pie update for Nokia 7 Plus? Google Pixel like round edge Notifications. Navigation Gestures are enabled by default. Following is the latest OTA update zip or full stock firmware upgrade package. The following OTA update is only for the international variant. Chinese variants will be updated soon. Chinese variants will be updated soon. So stay tuned. How to update Nokia 7 Plus to Android 9 Pie stable easily? If you haven’t received the Android 9 Pie OTA update over-the-air, then download the OTA update manually from below and install the OTA update zip file manually. Power off the device completely, and then press and hold the Power key and Volume Up key together for about 10 seconds. Release both the keys when the device vibrates. Now your device will get into Bootloader mode. Select the Recovery option to get into “Recovery Mode”. Select the option “Apply update from SD Card” from the recovery options. Navigate to the OTA update zip and select it. Open Phone App and dial *#*#874#*#* to update. Here is a simple tutorial on how to install OTA update on any Android device. That’s it enjoy Android 9 Pie on your Nokia phone.